The latest ranking of study destinations scores 125 cities around the world according to the ranking of their higher education institutions, attractiveness to international students, affordability, and employer recruiting. The QS Best Student Cities 2017 showcases some significant gains and drops across the ranking table, which in turn point to underlying demand factors such as affordability and shifting currency values. Indeed, that combination of affordability, quality of education, and student experience seem to have been the driving factors behind Canada’s strong performance in the 2017 ranking: four of the five Canadian cities included in the table moved up this year, and Ottawa took the top spot worldwide in the new “Student View” category. Student View is a new student survey factor in the QS ranking that measures students’ ratings of their city in eight categories: tolerance and inclusion, diversity, friendliness, ease of getting around, affordability, nightlife, employment opportunities, and arts and culture. Paris moves down to the second position this year, and is followed by London which moves up two places for 2017. Overall, six of the eight UK cities in the table rose in the rankings this year. Analysts attribute most of those gains to improved affordability scores for British cities across the board, owing to a post-Brexit weakening of the pound against the US dollar and other major currencies. On the other side of that coin, poorer scores for affordability led most US cities to fall down the table. 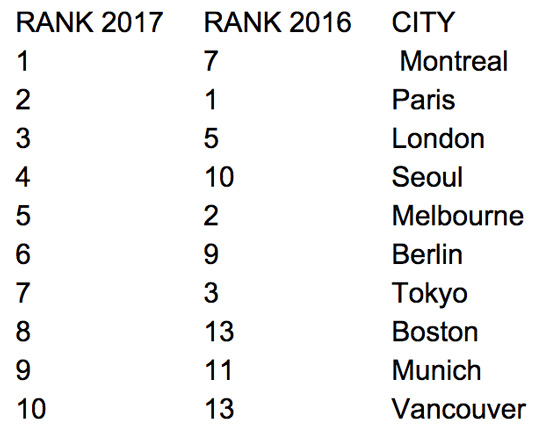 Ten of the twelve included American cities dropped down the ranking this year, leaving only one – Boston – among the top ten. QS notes, however, that Australian destinations continue to score high on its “Desirability” ranking factor, a measure that reflects global indexes for liveability and safety, as well attractiveness to international students. All told, the QS ranking rolls up scores from six ranking factors to arrive at a combined score for each of the 125 cities in the table. University Rankings: Reflects the performance of a city’s universities based on their placement in the QS World University Rankings. Student Mix: Indicates the size and composition of the student body in each city. Desirability: A more complex factor that weighs a city’s scores across a number of liveability indices, and also incorporates student input regarding the relative attractiveness of city destinations. Employer Activity: Reflects the priority that employers place on a city and its institutions in terms of employee recruiting. Affordability: Reflects both tuition and living costs. Student View: An online survey of 18,000 students in which respondents were asked to rate their city across several lifestyle and student experience factors. This entry was posted in Canada, Higher Education, North America, Regions, Research and tagged Study in Canada, universities with international students, student recruitment, international students, colleges with international students.